Bahrain, the 23rd May 1936. Offg. Political Agent A mid-ranking political representative (equivalent to a Consul) from the diplomatic corps of the Government of India or one of its subordinate provincial governments, in charge of a Political Agency. , Bahrain. 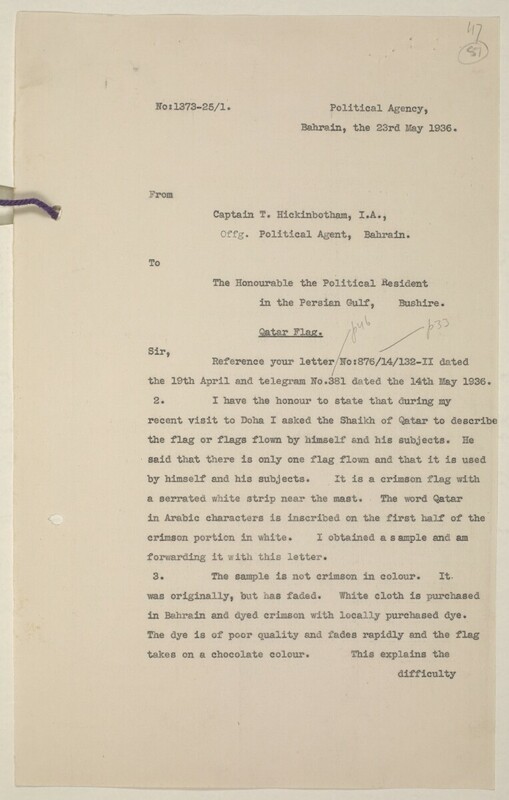 the 19th April and telegram No.381 dated the 14th May 1936.
forwarding it with this letter. 3. The sample is not crimson in colour. It. in Bahrain and dyed crimson with locally purchased dye.